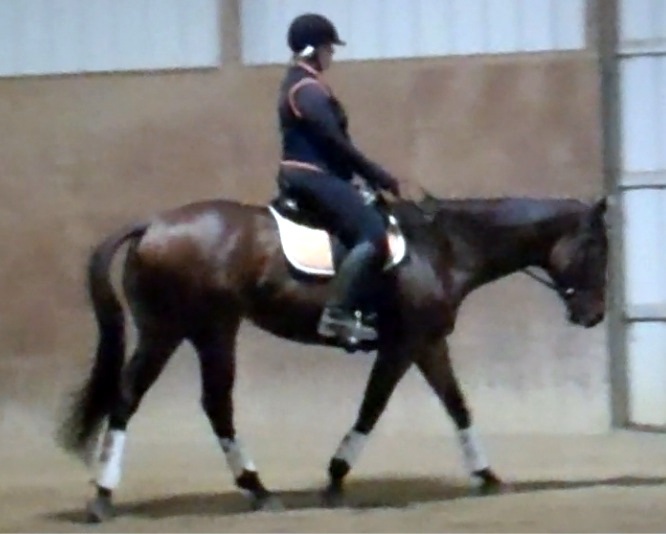 My holiday hiatus over, I was looking forward to getting back out to the barn last night for my lesson. However, though the mind was willing, the body wasn’t. One of my knees was killing me and the motion of posting was painful. So Christy reshuffled her deck, and announced that we’d do more warm up work in two point, and then work on sitting trot. We’re using two point to build my leg strength, so I can start carrying my weight more correctly, instead of relying solely on my stirrups. 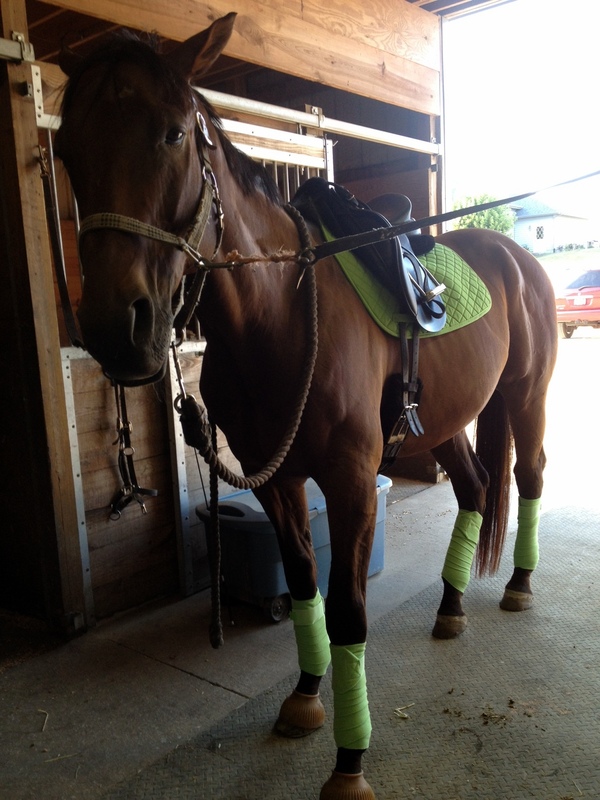 As I went around, I lightened my feet in the stirrups, taking more weight on my upper thighs. Then Christy upped the ante, asking me to take some contact and make the horse round. While in two-point. Now, this took some doing for me. I’ve not done much in terms of influencing the horse while working in two-point. “Think side reins,” said Christy. I closed my fingers, and steadied my hands. Derby started to pull into the contact, and rounded. “Good. Now send him forward,” said Christy. Still in two-point, I squeezed my knees. Nothing. Determined not to cheat, I squeezed my knees again. “This trot’s getting worse, not better!” Christy observed. “Send him forward!” After another minute of pop-eyed knee-squeezing, I asked Christy exactly how one sends a horse forward when in two-point. “You can use your legs and your core while you’re in two point,” she said. When she said that, the first light bulb clicked on. I realized that I hadn’t been using my lower leg at all – and the go button is best activated with the calves. I tightened my core, which magically connected my body to my legs (um. duh.) and eased my knees, letting my calves drape around the horse a bit more, despite maintaining the two point position. The horse rounded, and when I closed my calves, he went forward. “There you go!” Christy approved. So that was my first light bulb moment. From then on, I was able to ride the horse more forwardly, while maintaining some roundness, in a two point. It was definitely a first. From there, we took a walk break. Christy had me focus on feeling the motion with my seat, paying attention to which foot was falling where. Then she had me swing my hips, telling me to swing the horse up into a trot, and then continue following the motion with my seat. After a few rough starts, Christy noted that I was starting to curl forward, and was tensing up in an effort to stay light on the horse’s back. The result was a tooth-rattling ride that wasn’t any fun for the horse, either. “Lean back, and point your seat bones towards the front of the saddle, ” she told me. My next try was much more productive. 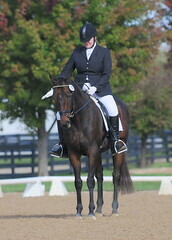 I was able to feel a few moments where the sitting trot felt really good and connected. Best of all, the horse was pretty happy throughout. Derby was staying fairly round – not popping his head up and going hollow. I fed him some extra rein, as my hands were still bouncing around a bit, and I wanted to focus on staying with the motion. Eventually, though, I was actually able to take and hold some contact while sitting, and Derby stretched into the contact, holding it nicely. I was stunned. While I wasn’t really moving Derby out in any semblance of a working trot, nonetheless, this was the first time I’ve ever maintained any semblance of contact and roundness while sitting the trot. One night, and two light bulb moments! Can’t wait to get out to the barn tonight!